Stop wasting time sending the same weekly update to the same list that never engages with your email. They don't open it, they don't click-through it and they aren't converting into highly-qualified leads. Instead, work to re-engage with your contacts. Re-engaging with your contacts can be the difference between losing them forever and converting them to qualified leads. Take the people who are not actively opening, or clicking through your emails and re-evaluate what you are sending them. They could be bored with your content, or they may have forgotten why they subscribed in the first place. Re-engaging with your contacts is a very tough task to accomplish. However, segmentation, patience, and creativity can give you a fighting chance and help you attract some of your stagnant contacts. Place everyone who has unsubscribed from your email service into a new list and delete it. It is actually illegal to email people that have unsubscribed for your email service. Continuing to email these people can get you blacklisted, email services may no longer allow you to send emails, and you may even be fined. Next, create another list of everyone who has stopped engaging with your emails. This means they have either stopped opening them, or stopped clicking-through them. This list should contain people that have not engaged with your emails for over two - three months. You don't want to put someone on this list that didn't open the last email you sent out a week ago, but just purchased a product from you two weeks ago. Now, take your list of email addresses that have stopped engaging with you and stop emailing them immediately. Do not email them tomorrow, or next week, not even next month. Wait approximately 60-90 days before sending them anything. This is just enough time for the people on your list to forget about your emails, but not necessarily your brand entirely. List one can contain people who have engaged with your emails in the last year but have stopped engaging about two-three months ago. Engagement here can mean anything from an opened email, clicked link, form submission on your site, etc. Anything that gives you a sense that the contact was interested in your product or service at one time. List two should be filled with people that have not engaged with your company in over a year and were never that into you in the first place. Maybe you had an automatic subscription box checked off while they completed a form on your site and once they downloaded the content they were looking for, they unsubscribed from your list never to be seen again. From here, you should segment your remaining contacts as specifically as you can. The more segmented groups you create, the more email variations you can test. The results of these tests can help you draw parallels between types of content, templates, subject lines, etc. and the people that you are sending these emails to. One group may end up reacting to gifs extremely well, while another group may think they look like spam and never click-through that email. You can learn a lot about your audiences preferences and behaviors with segmentation. Destroy list two. Leave no memory of what was contained within it. Pretend it never happened and move on. They are gone. After list two disappears from reality, you can commit all your energy to segmenting list one. Think of something incredible to say. This part may sound easy, but that is far from the truth. This message needs to compel the people you pushed away and re-establish your brand in their eyes. 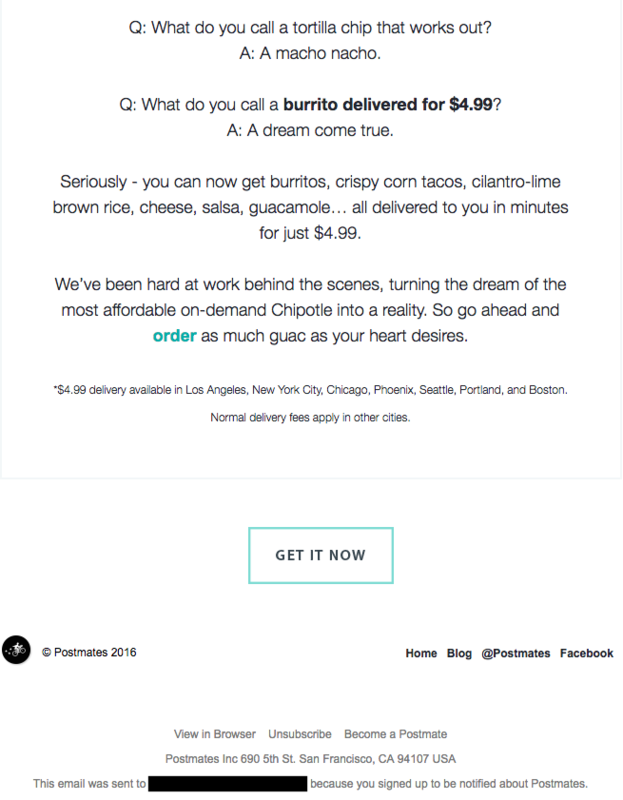 For example, this email from Postmates not only makes me want to engage with their content, I also am craving a burrito bowl now. Keep your expectations low. Even with an amazing message and segmented lists, you have already lost these contacts once before, so don't get your hopes up. It is an accomplishment just to re-engage with a few of these people. Only about 20% of your entire contact list engages with your emails, to begin with. Now, you are emailing the ones who haven't engaged with your content in quite some time.